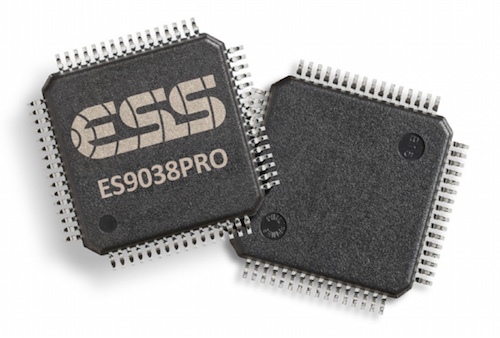 The ESS Sabre ES9038PRO chip has received a lot of attention and praised as the most important new DAC chip in ages. It offers such great performance and features so this is easy to understand. Depending on how the chip is used it can achieve up to 140dB dynamic range, -122 dB (0.00008%) total harmonic distortion plus noise (THD+N) in mono mode. It also has other great features as THD compensation to "minimize THD caused by external components". The few commercially available DACs using this chip are all quite expensive, which is understandable as the chip is more than 10 times as expensive as the ES9018K2M chip! So we are excited to announce that we are making a ES9038PRO DAC that will be very affordable, even though it will be our most expensive DAC to date. Our philosophy has always been to make affordable gear without charging hundred of dollars for diamond casing or making expensive and hip marketing videos. We have made a few different samples over the last few months and are finalising the circuit and doing additional testing these days. The DAC has many of the features from our UDA18 DAC: USB and SPDIF inputs, digital volume control adjusted in DAC chip, optional (not required) external power supply. It also comes in the same sized case as the UDA18, so it is a very portable DAC. It uses the ES9038PRO chip in combination with the OPA1622 output stage chip. This opamp is a newer generation chip with greatly improved performance. It can drive both line level loads and headphones with extremely low distortion, and we found it to be a very good match for ES9038PRO. Thanks for keeping up to date. Support for native dsd256 or even dsd512 which is within the capabilities of the chip would be much appreciated. Also rca outputs would be a must. And what about a built in battery charged from the USB as per the ifi idsd micro. Musiclover you are damn right. I would buy 2 of these the instant they were released if they had balanced XLR outputs. ... and coaxial SPDIF input. Thanks for your feedback! We'll add RCA outputs. But SPDIF input will be optical only. Can you make volume controllable by universal IR remote? And add optical input, also selectable by remote? With RCA output it could then be used to directly drive output stage amplifier, which would further improve sound and make system more affordable, by removing preamp. YES! Another 10 votes for a remote control feature, especially for volume control. There are no reasonably-priced DACs that offer this highly desirable feature! All those optical digital devices that have no volume control *need* this *badly*...! We can't promise anything yet, but aim to have first batch available in 2 months. Really excited to see an update on when something might be available. Would be great to have rca output and a socketed output opamp to allow the use of so called "discrete opamps"
I concur, rca output and socketed opamp, I'ld also love to be able to chose my opamp. good news. waiting for specifications. This sounds very promising! I'm still loving and regularly using your 9018d that is almost perfect (the only downside is that it is a bit too hissy with sensitive IEMs, however everything else is awesome) and affordable, too. I'm sure that if you can keep the hiss with super sensitive IEMs (very) low and if the output impedance is accordingly low as well, it could be a killer machine. Great news!! I´m really looking forward for the release of this DAC, it looks very promising. I hope it can be ready to ship before the end of the year! Good job. Looking forward to this Dac, I've got two Dac's from you guys and it's been nothing but excellent! Your products are still going strong without any issues. Dare I say it, this could be a game changer considering your price to performance has been nothing short of excellent within your product range! Best of luck and will be "add to cart" when released. Great news! RCA is mandatory. Looking forward to this one. I'm impressed with the DAC I already go from you. Would be nice if it was both Coax and Optical. My TV decoder and Android TV box only has optical out. It will have optical input. Very interesting news - but i´m missing a konkret offer for a DAC with this chip. Did i overread those offer? IT would be great if the DAC could als by used as RCA line in to SPDIF out. Then I could make a didgital interlink of 5 meters between my pre amp and tube power amp. That is called an ADC. I would however suggest a balanced, analog cable as the best option for a 5m connection. If you use a single-ended cable, then use a cable with a lot of cupper for GND, or put transmitter or reciever on an insulation trafo to avoid current in GND. will be it portable? usb powered is better. and price? Yes, same size as the UDA 18 DAC: https://hifimediy.com/uda18-usb-and-spdif-dac Can run from USB power, and can also be powered from external power supply. It works perfectly on our Xiaomi MI Mix phone (with type-C adaptor) without external power supply. Another Xiaomi phone required external power for it to work. iPad PRO needed a USB hub and external power supply. Why not use an AC out power supply, so you can make +/-15V, or at least +/-5V for a good analog output stage? Would be really nice a similar product like SMSL Idea which works fine on android devices as a portable solution of this new lineup! Really expecting good things as always. It should work on most Android devices, however Android's DAC support tends to differ from phone to phone between android versions. Been waiting for a ES9038 model from Hifimediy ever since I heard of the chip. Pretty much the reason I held back from upgrading my current DAC. Amazing news. Balanced XLR would be a solution as using it as a high quality audio interface. However, the most important think is not the DAC but the loudspeakers or headphones. Looking forward in comparing it with existing DACs. 10 times more expensive, 10 times more power hungry, and for what? 140dB DR and -122dBm noise level? How is that even remotely practical? Not to mention in final product those values are much more theoretical than anything else. The chip also has other features that improves sound quality, as the THD compensation. The es9038pro chip is 10 times more expensive, our DAC will not be 10 times more expensive.. Looking forward to seeing the final model and adding another DAC to my collection. However, you should also take a look at Schitt's Fulla 2 form factor, as its size and big volume knob on top is perfect for that desktop usage scenario (no fiddling about with software volume controls or buttons, just dial it to exactly where you want it). If it's called Pro, XLR outputs should be available, RCAs would be nice too. Thanks for the feedback guys ! Yes we can add RCA output, there's room for that on the front next to 3.5mm output. We won't do XLR, there is no room on this smaller DAC. It could be an option if we later make a bigger size "desktop" model. Excellent. An ESS9038PRO based DAC with RCAs sounds great. Nice to have RCA output, but is there à RCA input comming to? Or à 2nd DAC or ADC of you Will that van do RCA to Didgital? Any plan for a multi channel version in the future? @Vincent, RCA input do you mean digital coax input? That will probably not happen on this DAC. And about RCA to digital, that would require another device, as the ES9038PRO is a DAC not ADC chip. No, stereo RCA input. So i can make à optical interlink to my tube AMP. So analogie RCA to Didgital. That is what i am looking for. There are not manney divices capable of doing that. Wonderful News!! That's my wishlist come true. I'm hoping this will have 'most'of the features of Oppo's Sonica DAC, and offcourse, without the 'snake oil'. Eagerly waiting for the knight in the shining armour!! How low is the output impedance? I'm using UAE23HD with an headphone amplifier. One of the its advantages is I don't need to find a USB cable and a power supply to make the sound better. With this upcoming flagship DAC, I feel like buying a good USB cable. It's great to hear that you'll be adding RCA outputs to this DAC (although XLR would be even better). The main reason I've not purchased one of your ES9018 DACs in the past is the lack of RCA or XLR outputs. Could you please tell us how volume will be controlled on this DAC? Digitally through the DAC chip, or with some kind of analogue pot? Also, will the volume control apply to the RCA outputs? For use with studio monitors (which I assume will be the standard use for the RCA outputs on this DAC) some kind of volume control is essential. Thanks. The chip reads the setting of the potmeter and adjust the volume accordingly. This is different from an analog potmeter where the audio signal is routed through the potmeter. The volume pot will also affect RCA outputs, as the output from the DAC chip is adjusted. I hope this can accept a pure DSD input. I upsample all music files to DSD512 with HQPlayer, and my USB converter extracts the pure DSD stream - would love to plug this in. If XLRs are not going to be fitted - is there scope for DIY modding? My system is all balanced so I would never use RCA outputs. Will you be making a smaller form factor one similar to the 9018? Would definitely buy if so, want something portable. It will not fit inside the tiny Sabre 9018 sized case. The case we use is already quite small and portable. +1 on socketed opamp chip. All opamps need to be socketed! Also, please have *fixed* line outs on the RCA -- i.e. the volume knob has no effect on the output levels. Looking forward to this in November! The volume potmeter adjusts the output from the DAC chip, without any signal loss. If you like it at full volume then you can just leave it on max for RCA. Hey HIFIme ! I totally get the difficulties of adding features for everyone's setup requirements. It's an impossible list. But some connections are so popular you think WHY DIDN'T YOU. Electrical SPDiff is that moment. Come on lad's... get it sorted for us. I'm 99% sure Schiit doesn't do any upsampling. They are very "bit perfect" and "true to the original source" kind of guys. It's debatable that the sound quality is actually improved by upsampling anyway. i wouldnt wont anything else than as close to the source audio reproduction. in a DAC! I would consider buying a higher end version of the HIFIMEDIY SABRE USB DAC 2. USB-in and RCA-line-level-out on the back, headphone-out and headphone-volume on the front. I do not buy DACs/amps that have no line-level output for speakers. The volume knob must ONLY control the headphones, not the back speaker output. And it would be nice to be able to connect the outputs at the same time working independently. But I doubt it will be a lone level output, as HiFimediy mentioned before the volume is controlled at DAC level. The reason we'll put the RCA on the front is because there is where the signal is. Yes for DACs where there is a active or passive volume control circuit it would be better to have the line outs outside this circuit. But in this design (same as on the UDA18) the volume pot doesn't affect the sound quality, it's not an analog potmeter. The volume control sets the output level from the ES9038PRO DAC chip. So if you want it at full volume, then simple set it to max, and it will be the same as if it wasn't there. any chance to have multi channel KIT version of it? Another vote for a remote control for volume control. That would make this device perfect for going between an optical SPDIF output (like the TOSLINK output of my HD television) and my power amplifiers or powered speakers, eliminating the need for an A/V control unit. Any updated eta? Need a new dac soon. HIFIme ! I totally get the difficulties of adding features for everyone's setup requirements. It's an impossible list. But some connections are so popular you think WHY DIDN'T YOU. Electrical SPDiff is that moment. Come on lad's... get it sorted for us. We've been enjoying listening to the samples for some time now, and the sound quality is hige above that of all our other DACs. It's really a joy to listen to. Unfortunately it looks like we're missing our November goal, so we're looking at December delivery. Will this product be capable of handling multichannel 192-24 on its input? Is possible fix this DAC as external DAC into the Sony HAP-Z1ES. Very interesting in your inquiries about this matter. With the Hifime 9018D USB DAC it was not possible. To Vincent: The HAP-Z1 only takes flavors of Digital Input. A DAC is a Digital-to-Analogue converter. ( You knew that really ). So the process would be redundant even if HAPS-Z1 could take Analogue. May be you meant on the Output. Ideally SONY should have made it with Digital outputs so we could utilize there fabulous internal processing in other ways, say with a later/better DAC as this one. But with SONY they just love to be OTT about Digital rights. The boys at HIFIme have got there work cut out for them, as every potential component & link is a choke point for such a high performing DAC chip. Especially at a limited cost. Oh so wish it was Electrical SP-Diff. I'm very excited about this project! I've been looking for a reasonably priced ES9038 implementation! I have a few questions -- What regulators will you use for the various supply voltages? Also, what design/parts will you use for the output stage? Lastly, would an 8-channel version be available? I have a DSP which outputs 4 stereo pairs for a total of 8 SPDIF outputs, and I would love to have an ES9038PRO for all 8 channels. Hi Teddy, thanks for your input! We've made a special design so that it can power from USB at 5V, but can also power from external DC up to 12V to better drive higher loads. Output stage is using OPA1622. This DAC is 2 channel, we might consider other versions later. It looks like it will be December. We're hoping to have some ready for Christmas, will know more and post preorder link soon. If I were to wish for just one thing with this new DAC, it is proper measurements. Primarily: - THD at specified frequencies, maybe even multiple (i.e. 20Hz, 100Hz, 10kHz) - A-weighted Dynamic range - Frequency response Secondarily: - Intermodulation distortion - Linearity error - Crosstalk - USB Jitter - Latency If you take he time to do some of these measurements it would also be greatly appreciated if you could redo them for your more popular products, for example the 9018DAC and the UDA18, so that we have some consistent numbers and test methods to compare. DON'T RUSH THIS. RELEASE IT WHEN IT'S GOOD AND RIGHT. NO CHANNEL IMBALANCE. NO STATIC. NO NOISE FLOOR. Hi, thanks for your advice and concern. Yes we want to get it right, it's taken a bit longer than expected but we're getting there. is there a chance to see an ES9038 driven amp like UD 80 from you in the near future? Hi, the ud80 uses another chip (STA328) that can drive speakers directly, it wouldn't be possible with a DAC chip like es9038, that would be a integrated DAC+amplifier device. An ETA as to when this chip might be available to buy it's exciting. I agree with the comment on not rushing this implementation in any way - but can HiFimeDIY share any more detail as to a release date or price ? Hi Carl, it is in production now and should be available within 4 weeks. Another vote for remote control! It will make your DACs appeal to much greater audience. Implementation should not be very difficult and costly. Thanks for the feedback. 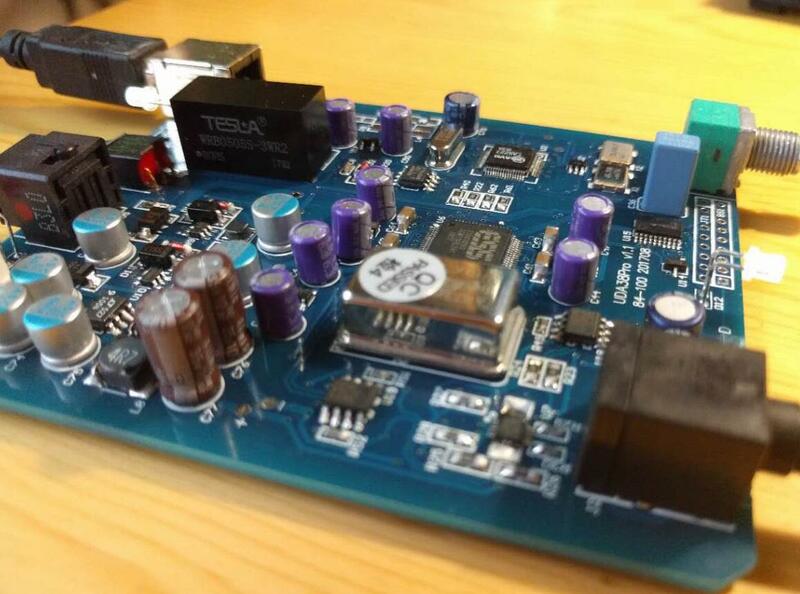 This DAC will not have a remote, but we'll keep this in mind for a next version, we can look into that when soon. Please update us with ETA! This product is exciting! Sorry it has taken longer than expected. It should be available within 4 weeks from now. When we can offer new dac? answer please. Any news regarding release date? Any chance to have it playing MQA-files in order to enjoy Tidal Masters? Any DAC will do for that, it's up to the playback device/software to decode the MQA-file and present a bitstream for the DAC to convert. @David, do you know any stand alone device that unfolds the MQA-file and them send the bit stream to any given DAC? Is there a software that Tidal could send the MQA file to and from there send it to externa DAC? I think not. In theory I hirds you are right but there are obstacles such as MQA license to deal with and now that serveral brands bought the license from MQA I doubt you’ll see what you describe (David) happening anytime soon. Correct me if I’m wrong. Yes, as the volume control is lossless this will work. Hifime, any updates on the specs, ETA, price? Don't rush them otherwise it'll have issues. Hifimediy, please provide specs and aprox. price please. Can you make sure it can play older pre 1970's music? The latest DACs are unable to play music made before 1980 due to their incompatibility with older music styles. That's fine for those who like modern music, but some of us enjoy the older music and it's not fair that we are unable to hear it due to technological limitations. I believe there are workarounds that will allow you to use even a brand new chip like the 9038 to listen to pre 1970's music, possibly even classical music. Please do the work to make this happen and you will sell much more product for a higher price. You don't need a Digital-to-Analog Converter (DAC) as they are not music players. What you need a good Analog-to-Digital Converter (ADC). Get yourself a laser disc player. You can find them used on ebay. Just make sure it is the kind that can play records. Hi guy, sorry it takes a while. We're making a few more samples to compare gain setting and some final adjustments. Once we have this set we will have the first batch ready quickly. Will update you all soon. Price will be around $300. Excellent, I was just going to ask about price, very interested in this, I may have to sell my uda18 for this, to confirm rca is a yes confirmed? $300?!?! That's a lot. It better have special features not in your average $100 dac/amp. Price is ok if SQ is substantially better than 9018D and its upgraded version. Why not offer it at an introduction price, so us loyal customers can work for you through word of mouth marketing? Ahhhhhh.... $300. That's just a bit too rich. The rest of us HiFiMedies have been used to lower numbers. The playing field we're in is a compatibility nightmare, and lower prices help us balance the risk. After all, not many of us who would be rich enough to have 140db resolution are going to be looking for $300 DAC's. $250 would help your regular core of supporters promote your gains. Lets face it, this next radical tech step is gonna leave us doing the Beta testing on so many devices anyway. Play nice HiFiMe ! Very disappointing price tag. Consider creating a cheaper version without RCA, and XLR, etc... and make it upgradeable to give a little bit of DIY feeling back to it. Thanks for the feedback. We'll see very soon how low we can push the price. The DAC chip is much more expensive than es9018k2m or any other chip we have used in the past, so it's not possible to make it within the price range of our other DAC's. But now we will soon have all the costs figured out and will calculate the final price. Thanks for the update! $300 can be considered acceptable price if sound and features are good. Hopefully the new ES9038PRO DAC will have all the UDA18 features, with additional features as the following: 1. RCA Line Out. 2. Built-in USB power filter to clean the DC power from USB. 3. Higher and wider range of DC voltage external power input, for example from 5V to 9V, for flexibility to use various external batteries, for example 2x 18650 batteries, etc. 4. Nicer looking casing. No need to be too expensive, just something nicer ;) Thanks! With such a high-spec DAC, it wouldn't make sense to make a cheap design around it - putting a Mercedes motor in a Lada won't make you happy. Consider using crowdfunding platform like kickstarter.com or indiegogo.com. Nice option and not to be negative but if its 300usd its a bit out of many peoples price range if you live outside the US. Will this be compatible with Android smartphones running USB Audio Player Pro? Really curious because I currently use my phone with an ES9028-Q2M equipped USB DAC and headphone amplifier and would like something with the ES9038 Pro DAC to use with my phone. I would be appreciative of all feedback! I would like to add that the price is important however you cant make it sound poor just to be able to sell it for $250. There is no point. Like others have said get the sound right and see where you sit. I have the Pono portable DAC which uses the 9018 chip and an Oppo Sonica Dac which uses the 9038....Pono was about $350USD and the Oppo was $800....if you can get the 9038 for $300 I think you should consider it a great value(although perhaps more than most WANT to spend). In my opinion it's worth it....I know I plan on getting one to replace the Pono. You answered your own question. This will be portable, unlike the Melokin, and will have the full chip, unlike the pos downgraded Q2M chip used in the Topping and Pro-Ject. Will this support playback through the USB Audio Player Pro app on Android Smartphones?? I believe this would need Asynchronous playback capability and be supportive and compliant of the USB Audio 2.0 Standard. Is this within the capability of this product?? Please give it a shape that is longer and more like a round cylinder with no sharp edges, instead of shaping it like a wide and flat rectangle. Eagerly waiting. Any definitive ETA HiFimeDIY? Hi guys. We're almost there and will soon put it up for sale. We have been making samples with a few different gain settings to compare by listening. This is what has taken longer than expected. I think they're still number crunching because the US Dollar has to stabilize after the FED shutdown. Oooohhh gone all dizzy saying that. Best get back to music listening. Hi everyone, it's now available to order! https://hifimediy.com/uda38pro-usb-dac-es9038pro Some more data will be added to the description soon. We do have a few units available now, and more after Chinese New Year. And we managed to get the price down to $249! Are the RCA jacks affected by the volume control? Are they real line out or are they going through the headphone gain stages? Yes the volume control also adjusts the RCA outputs. The ES9038PRO chip can't drive any loads directly, so an output stage is required, also for line level. The opa1622 isn't just a headphone amplifier, it drives line level also. Performance to line level will increase when higher voltage (9-12V DC) external power supply is connected. So at max volume, what will the voltage be of the RCA? 2V? Max voltage at RCA without external PSU is 1.5Vrms and with 9V external DC max is 2.6Vrms. They shipped from Shanghai already, will go through Hong Kong and you'll receive tracking number soon. Do a review on head-fi after listening to it for a week. Which external PSU do you recommend? Be careful with hifimediy's external PSU's. Once I got one of their desktop (i.e. not the tiny one) 9023 dacs with their recommended PSU but the PSU didn't work I had to buy my own off of Ebay to match the voltage requirement. The DAC worked perfectly though. I have never tried any HiFiMe PSU's, but given the excellent work they have done getting the 9038 to us; I would be extra fussy. HiFiMe won't comment on other manufacturer products, but at the risk of being rude I will be looking at the "IFI" range of psu's. The're very very good bang per buck and are capable of unleashing the 9038pro's fullest potential. Really think the clean power can bring the Hifime Es9038pro in to a final solution status, where you only have to bother looking at the rest of your system from here on in. does this dac do usb to i2s like uh1? and why did you use two clocks in uh1 vs 1 in prodac? Yes it's in same way. This DAC also have 2 oscillators for USB. The 80Mhz TCXO mentioned is for DAC chip. Hi Hifime, are you including USB Isolator in UDA38Pro? We did try it, we made some tests units with isolator chip, however it had some side effects like not working at all without external power supply, so finally we decided to no include it. Will this work with a Raspberry Pi using OSMC or LibreElec? Kodi being the main app for use. I too emailed them the RPi question. I was told because it complies with USB audio there should be no issues with the RPi. As for running any of the live Kodi OS's they are both updated regularly, so OS compatibility chances are high. I wont commit to saying guaranteed to work even if it is tested ok. Because sometimes new updates can break compatibility, like was the case with the Android-6 update with some of HiFiMe's 9018 products. Life can be tough when your chrystal ball doesn't work. On a second note, I hope they can give us some Signal-Noise figures at the output soon. How long does it take to ship after an order is placed? And why don’t you accept PayPal? We will send out many orders this week. If you place an order now it will take 2-3 weeks until we can send it. We do accept PayPal. Send us a message if it doesn't appear as an option, it might be related to what country you're in. Is there any way to play with the FIR filters? Just received the es9038pro dac, it works in out of the box with USB and OPT mode. I can hear it's dynamic and crystal clear sound. Will review in more detail after the DAC has burn in for a while. Thanks Raymond, Don't forget to let us know what type of PSU & equipment your using. If you can give us any comparisons to other famous DAC's or chip sets would also help. Enjoy !!!! PSU is really important to provide constant current to the DAC. I have used a cheap PSU 9V & 800ma. It chops the music occasionally. Now using a better PSU, 12V and 5A. the chopping sound problems are solved. My first impression that the new DAC gives me more detail and more transparency. Especially good in listening Jazz music. is there ASIO drivers working with common DAWs? if yes, at what latency. you may try free reaper for testing. Raymond, if you using Windows 10 I suggest still installing the SA9227 driver and compare sound quality to Windows 10 native playback. Also, if using headphones compare headphone out jack vs. RCA out (w/3.5mm adapter). Basically, I use foobar in MacOS platform. Performance are very good. I also cast android phone Flac music to Chromecast Audio through the opt input. The music is quite transparent and detail. So far so good indeed. I don't use headphone. But I can try try the headphone jack vs RCA out. Hopefully you got the newer revised version of the dac. It sounds better than the one sent to me the first week it was released. Little more natural. Does using the RCA out bypass the OPA1622 to a different opamp? I think they use the same OPA1622. I have tried, they have nearly the same output in volume. sa9227 does not support dsd http://www.saviaudio.com/product.html If UDA38 pro supports dsd, does it support native dsd? I can play the DSD file format. I can play both DFF/DSF in my foobar2000. DSD transfer is native or DOP? I have no ASIO driver used. So, it should be DOP I think. Is there a chance to post within Europe, from EU warehouse? We can send via our Belgium agent, chose the EU shipping option. I only have two options for this product, HK Post and DHL/Fedex, both ship from China, no option to ship with Belgium Post. I just double checked again. Can someone else check? Is this problem only on my end? Never mind. It looks like the problem appears when I wasn't logged in my account. I was able to choose EU shipping from my account. Thanks. Hi, I have received my unit here in Indonesia, pretty short leadtime in delivery. I use Onkyo HF player (Pro) on my Xperia XZ Premium through USB-C to USB-B cable. At this point of time, I am still unable to play 'DSD direct transfer' as I usally did with my other DAC with XMOS XU208 USB receiving chips. The best I could use is 'DoP'. Did I miss some step here, or it's just not supported by SA9227? Nevertheless, this is the best sounding DAC I have ever heard..!! To me, it's presenting clarity, much detail, deepest low, with darkest background. I dont feel fatigue listening to it for hours, its sounds characteristic just easy, fun, and flows. Which filter was chosen for this DAC? ESS comes with 7 choices, but the Pro doesn't let us choose. Which filter does it come with? Also, does it have the THD compensation? Never mind, I see it mentioned in the description. Missed it the first time. One more thing: the revision is better than the first version I received. I heard the difference immediately. Does using an external power supply provide any other advantages than the higher voltage/power output? You also get lower distortion, better performance, especially at higher impedance loads. A good quality, low noise power supply will also improve sound quality. y dont u guys use a 2.5mm or 4.4mm balanced connector?sorry if this a stupid question lol. How can I tell if I have the revised version or not??? My DAC sounds a little harsh, I wonder if it’s because it’s the first version? What value of THD have you measured? Could you post results with power supply and without? You have removed this specification from the description:"THD+N-116@32ohm" Why? I bought this Dac in June, trusting the specifications indicated. If the values are much lower as described in other sites I would like to evaluate the refund. Please be honest with your customers. is there ASIO drivers working with common DAWs in win7x64 or win10x64? if yes, at what latency? you may try free daws like reaper for testing. Yes, the drivers support ASIO (you can download the driver from the support page) and they work fine with Reaper, JRiver Media Center, etc. does it make any "clicks" or "pops" when changing source? for example when starting to play music or when going from a dsd to a pcm file(or vice versa) my other xmos dacs do make an annoying "click" that is small with headphones but almost dangerous with speakers… does this dac has the same problem? anyone using it with speakers? Whatever replacement you make for the UDA38Pro, PLEASE add coaxial input, not just optical...(and LT3045s would be nice too).